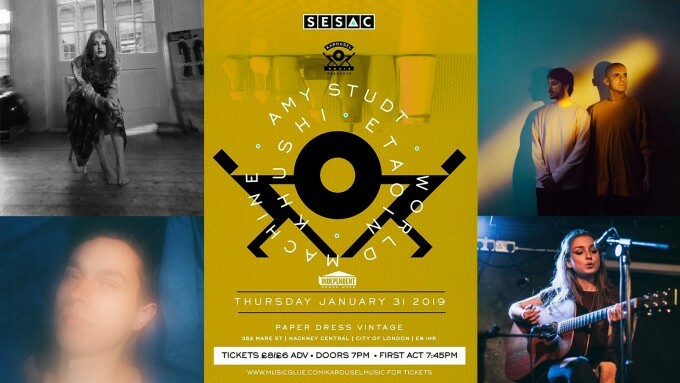 Karousel Music & SESAC return for the first edition of their regular showcase night for 2019 featuring Amy Studt, KHUSHI, World Machine and Etaoin as part of our program for Independent Venue Week 2019! Khushi is a singer/songwriter/producer from east London. Having spent the past three years as part of the critically acclaimed band Strong Asian Mothers, making A-list on BBC radio playlists, he is branching out on his own with a different sound, with this deeply personal and beautiful project. The music features understated, tasteful production allowing songs for all the ages to flourish / shine. Khushi has also recently collaborated with James Blake, namely on Blake’s hotly anticipated new album, Assume Form, and Blake has worked on Khushi’s forthcoming album as an exec producer. They will be touring together across America for a month beginning February 15th. As Warner Bros newest signing, 2019 looks set to be an incredibly exciting one for this artist. Etaoin is a 22 year old self taught singer/songwriter from London whose roots sink deep into the rivers and banks of Southern Ireland. With an old head on young shoulders, she has been waking up her neighbours at ridiculous hours of the night by playing music too loudly from the young age of 12. Influenced by storytelling songwriters like Tracy Chapman, John Mayer, Bon Iver, Taylor Swift and George Ezra – she lends herself to tuneful melodies and picture painting quirky lyrics.